Fair. Somewhat grubby on the outside as folded and with many pencil annotations on the written side. Remains complete and legible throughout. 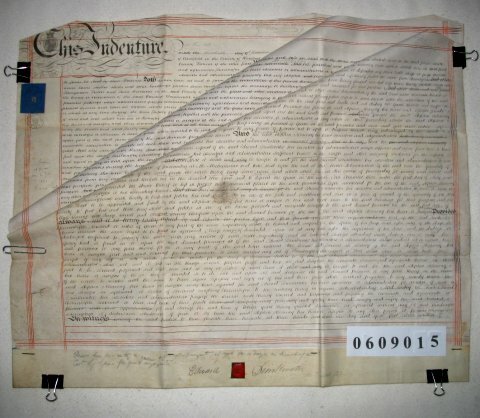 Parchment : 3 sheets 56cm x 68cm with 1 wax seal, signature and revenue stamp. Stephen ALLAWAY of Courtfield, Herefordshire. Esquire. Edward DRINKWATER of Furrible Farm, Herefordshire. Farmer. Parish of Llangarren. Stephen ALLAWAY is granting a 12 year lease on Furrible Farm to Edward DRINKWATER at a rent of £440 per annum. The property has a total of 250 acres and lies in the parishes of Llangarren, Tretire and St Weonard. The final one and a half sheets of this indenture are devoted to conditions placed on Edward Drinkwater concerning care and husbandry on the farm. He will use "the four course system which is the approved custom of that part of the county", protect the fruit trees from damage by livestock; he will not sell any timber from the farm etc etc etc.